New York City’s largest exhibition of the world’s best independent, professional and student animation begins Friday, July 25th and ends Sunday July 27th !! 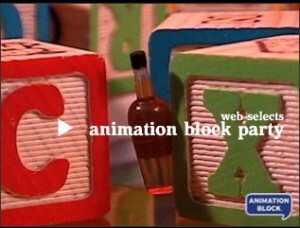 The official film lineups for the jam-packed three day annual festival is available on the Animation Block Party website at www.animationblock.com. Opening night kicks off at Rooftop Films with ABP’s most fun and fan friendly cartoons, including an exclusive excerpt from an upcoming Sundance Channel web-series entitled “BREAKFAST”, which was produced via Animation Block in conjunction with 2005 festival alum, Bob Fox. We received the whole schedule, which is way too long to reproduce, but for more info, click here. i will be there no doubt.